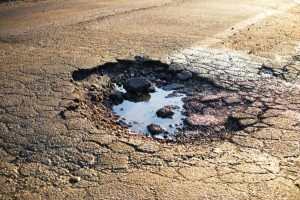 The Freight Transport Association (FTA) has responded to claims by the Local Government Association (LGA) that logistics providers across the UK are adversely contributing to the nation's ongoing potholes problem. Describing the claim as "inaccurate", the body instead argued that a lack of investment in proper transport infrastructure repairs has been the main problem that has meant potholes continue to be seen on roads up and down the country. FTA head of policy Christopher Smelling stated: "The LGA's assertion that HGVs are solely responsible for the increased number of potholes on Britain’s roads is incorrect. It also indicates a clear lack of understanding of the impact of freight vehicles." He concluded that this is simply a "cheap attempt to make headlines" and the real issue at play is the need for more central government funding to address what has become a blight on all road users. Local authorities face ever-increasing bills to keep on top of potholes in their area and more support is needed at a national level to bring this serious problem under control. Natalie Brinkley, brand manager at Fuel Card Services, adds: "Potholes remain a significant hazard for motorists in many parts of the country. It is therefore essential that more action is taken to fix dilapidated roads and the lead on this has to come from the government."